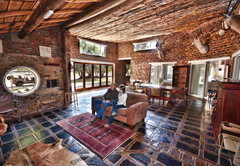 Otterskloof Private Game Reserve is a 4 star graded game lodge offering Philippolis accommodation for tourists and visitors of the Xhariep Region. 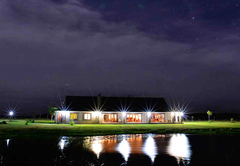 Otterskloof Private Game Reserve lies on the border of the Free State and Northern Cape along the majestic Van Der Kloof Dam. 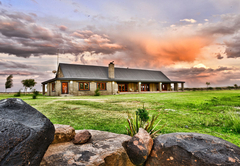 Set in an unique part of South Africa, this jewel of the Free State awaits to surprise our visitors. The reserve is set on 13800 hectares of dramatic Karoo landscape with an unique river ecosystem containing, amongst others, breeding pairs of Cape clawless otters. 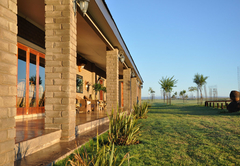 Safari Lodge is the main lodge and offers luxurious catered accommodation in a revamped farm homestead - each room with it's own separate entrance. 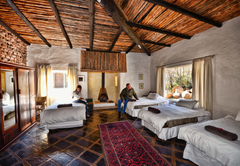 Standard Twin Rooms - En-Suite: Coffee making facilities, room fans, room heaters, warm blankets, shower. 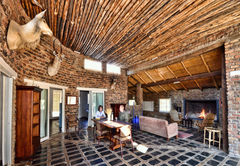 Otterskloof Private Game Reserve offers boutique conference accommodation in a spectacular setting, a mere 2 hours drive from Bloemfontein. Situated on the banks of the Vanderkloof dam, this 14 000 hectare resort offers small groups (up to 22 delegates) room to expand their horizons. Remote Lodge,rented as a unit. 45 minute drive from main lodge in a high-clearance vehicle. 3 en-suite rooms with shower-3 of the rooms have twin beds and 1 of the rooms have 4 single beds. No electricity, gas appliances and LED ligts-generator available. Two large rooms with double beds and 11 rooms with twin beds with en-suite bathrooms as well as tea and coffee facilities. Additional beds available. One of the rooms has a built-in fireplace and two rooms have baths. Each room has separate entrances. En-suite bedrooms (one with a bath and shower) with twin beds. Without airconditioning. Coffee and tea facilities and a bar fridge. 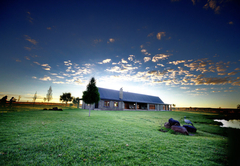 Two bedrooms with twin beds - one en-suite with bathroom - fully equipped for self-catering and braai area. It was one of the best places we've stayed at in years. The staff is very friendly and makes you feel at home. Margaret and her husband was amazing as well as the owner, Abel. Thank you for a wonderful experience. We will definitely go back. 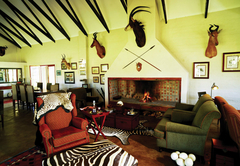 Response timeOtterskloof Private Game Reserve typically responds to requests in 5-10 minutes.